GROOMG SMARTER: WHAT ARE CAGE DRYERS? Cage Dryers are not only an effective time-management tool for professional pet grooming, but are also necessary for puppies and geriatric dogs or corded coat and rustic coat breeds, in which the high velocity airflow of force dryers can be traumatizing or counter-productive. Cage Dryers produce the largest air volume of all commercial dog dryers to pick up moisture easily from damp coats, promoting evaporation. Since cage dryers are used to direct airflow into semi-enclosed kennel spaces, it is crucial to emphasize a low air velocity and safe air temperature so that dangerous situations may be prevented. 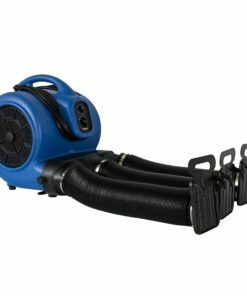 AirChaser.com carries the best dog grooming cage dryers for sale, manufactured by XPOWER. XPOWER Cage Dryers are designed to provide ease and comfort to both the dog groomer and the dogs. Cage Dryers are ideal for those busy days at the grooming salon, where kennels are occupied with a higher number of dogs with damp coats. 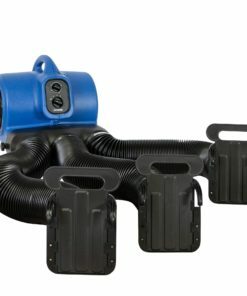 As a time-management tool, XPOWER Cage Dryers provide a 3-hour timer and combine with a cage dryer attachment—the Multi-cage Drying Kit (MDK), which attaches 3 hoses to the cage dryer—to give you the option of unsupervised safe drying on 3 individual dogs and freeing up your hands to bathe or finish additional dogs. Cage Dryers are also important for specific types of dogs on which a force dryer would be ineffective. For sensitive dogs who become anxious from force dryers, cage drying offers the most pleasant experience and can be introduced to them after most of the water have been absorbed by towels. For corded and rustic coated breeds, towel drying and air drying may be preferred for maximum water removal, with cage dryers being the ideal equipment to dry the rest of the moisture safely and effectively. Cage dryers work best when combined with other drying equipment or methods, and should never be used as the primary drying equipment from beginning (saturated coat) to end (fully dried coat). Although heated cage dryers are preferred by some dog groomers, the danger of cage dryer deaths mustn’t be overlooked. The risk of dogs overheating is extremely high when heat circulates in a semi-enclosed space, and XPOWER Cage Dryers draws room-temperature air that is safe to circulate within a kennel. Another safe design is in the cage dryer brushless motors; with no carbon brushes, XPOWER Cage Dryers do not produce carbon dust that may irritate the dog’s skin and lungs. 2 models of XPOWER Cage Dryers are available, with 1 providing more air volume than the other; whether you have a busy grooming salon or simply have frequent visits from sensitive dogs, you will find the best dog grooming cage dryers for sale at AirChaser.com. Maximize daily grooming output and increase grooming business with our ETL certified pet cage dryers for professional pet grooming. In stock & ready to ship. Overbooked grooming salons need a safe and efficient cage drying system to maximize daily grooming output and manage time wisely. We offer one of the best cage dryer system in the market with safe and no heat dryers, efficient hoses and timer functions added to help grooming shop increase revenue.